Ask any producer what accounts for most of the costs of production for their operation and they will answer, “It’s the feed.” Because of that, livestock producers are always on the lookout for opportunities to lower this cost without compromising production. According to Hugo Ramirez, assistant professor and extension dairy specialist at Iowa State University, including more forage in rations can lower the cost of production but only if the forage is of high quality. 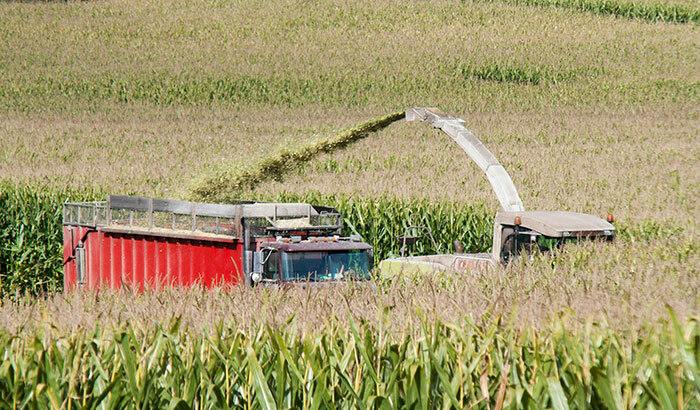 “Corn silage is unique in that it contains both grain and forage,” Ramirez stated during the 2018 Iowa-Wisconsin Silage Conference held in Dubuque, Iowa. “This combination provides animals with dense energy in kernels and rumen-stimulating fiber from leaves, stalk, and husk,” he added. Producing high-quality corn silage is not an easy task nor can it be ensured with one simple decision. The process of producing high-quality corn silage starts with hybrid selection, continues in the field as the corn grows, and finishes with packing and covering the silage. While there is little that can be done to control weather conditions during the growing phase, harvesting practices are easy to control and have a large impact on quality. Ramirez identified five key aspects in producing high-quality corn silage. “Moisture content is crucial to determine the proper time to harvest corn silage,” Ramirez stated. Moisture content can range from 60 to 70 percent with 65 percent being the ideal environment for fermenting bacteria growth and proper compaction. Silage with more than 70 percent moisture can develop undesirable bacteria such as clostridium, which leads to higher dry matter loss and reduced palatability. Seepage also is a possibility. If silage is below 60 percent moisture, it is harder to pack, which allows more air into the material. Not only will the silage pile have low density, but mold and yeast growth is also likely due to elevated oxygen levels. “A corn plant maturing and drying down is related to the deposition of starch in the kernel, or formation of the milkline,” Ramirez said. Optimal starch deposition is seen when the milkline is between two-thirds and three-quarters of the kernel. Starch content can grow by almost 1 percentage point, and corn plants will dry down 0.5 to 1 percentage point each day. The theoretical length of cut (TLC) in processed silage should be ¾-inch, which is about the width of a penny, and ¼- to ½-inch in nonprocessed silage. Too coarse of a chop leads to packing difficulty that can cause spoilage or poor fermentation. An optimal particle size impacts feed intake and rumen fermentation. The outer layer of the kernels, the pericarp, limits microbe access to the starch within the kernel. “Kernel processing literally unlocks the energetic potential of the starch contained in the corn kernels,” Ramirez explained. Kernel processing scores can be determined by sending samples to a forage lab. Scores less than 50 are inadequate, 50 to 70 is adequate, and anything higher than 70 is ideal. Although this method is accurate, it doesn’t allow for quick decisions during harvest, Ramirez highly recommends monitoring processing during harvest. One possible method is using a 32-ounce cup to collect a sample and then counting how many whole or partially-damaged kernels are found; have a goal of less than two, ideally zero. Tight packing paired with complete sealing creates an anaerobic environment ideal for bacteria responsible for fermentation. Ramirez recommends calculating packing capacity before harvest. Ensuring there is enough weight and that forage is delivered at the appropriate rate will help achieve the target density of 15 pounds of dry matter per cubic foot or more. A calculator is available online through the University of Wisconsin-Madison to help estimate silage density. To minimize dry matter and nutrient losses, cover silage with an oxygen barrier film as well as black and white plastic. Lining bunkers with plastic will help reduce losses further. Extra weight on top of covered silage prevents air exposure and keeps covers down. Tires are most commonly used. While it may be labor intensive, the return for such a practice makes it well worth the effort.